​Welcome to my classroom website! After a career as a lawyer and raising three children, I decided to pursue my long-held desire to teach. 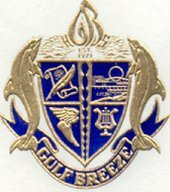 I'm privileged to teach at Gulf Breeze High School, a community of engaged parents, students, faculty, administration, and staff. I look forward to another terrific year of learning in our exceptional environment. /Grades are calculated on a point system. Each 9-week average is a percentage of the total possible points. Sixty percent of the overall grade will be based on major assignments such as essays and tests. Classwork and homework will comprise the remaining 40%. Grades are updated frequently. Students and parents are encouraged to check Gradeline regularly. Grade column is blank or has a "?" - means grades for that assignment have not been entered yet. A "Z" indicates the assignment was not turned in. A "NG" indicates an exemption from the assignment. Access Gradeline through the school website. Students will be instructed on how to avoid plagiarism. Students who cheat, pay others to complete their work, or otherwise plagiarize will receive an automatic zero on the assignment and a disciplinary referral. Students are responsible for determining what work was missed during absences (a missed assignments folder is located in the classroom). Work assigned before an absence is due upon the students return to school unless otherwise excused by me and/or Guidance. Students cannot make up any tests or quizzes missed during an unexcused absence. English classes: There will be several writing assignments (known as Embedded Assessments) throughout the year that will be heavily weighted. Failure to turn in these assignments will likely result in a failing grade. Students should make it a habit to write down all upcoming assignments in their school agenda. There will be a weekly schedule on the board. Additionally, this is a Remind classroom. Remind is a communication tool that helps teachers connect with students and parents. Reminders and announcements can be sent to students and parents via text messaging or email. Actual phone numbers are never visible (to teachers or to students), making Remind safe/secure. To register for my English III announcements via Remind, please send a text message to 81010 with the message @b3c8b. You may unsubscribe at any time by replying "unsubscribe". You do not have to download the app to receive announcements. Students are strongly encouraged to sign up for Remind. You may also sign up for email notifications in addition to or instead of text messages. To sign up for English III notifications, go to https://www.remind.com/join/b3c8b. *Please note, a lack of a Remind notification is not an excuse for missing work; these messages are sent as a courtesy only.